Scientists have finally discovered a fountainhead of water in earth’s layer. The fountainhead is so immeasurable that it could fill most of the earth’s oceans 3 times over. The discovery suggests that the Earth’s aspect water indeed did come from within. This kind of information and our understanding on how earth was formed and how different layers function, can help us predict the future. Climate change, sea levels and the weather are closely linked to tectonic activity that takes place beneath our feet. Scientists and geophysicist who authored this study used data from the USArray. (Hundreds of seismographs that are located all over the US constantly listening to the movements in the mantle and core of the earth). The researchers after a few years of listening, and lots of complex calculations, believe they have finally found a huge water reserve in the transition zone, found between the lower and upper mantle. This region occupies between 250-410 miles (400 and 660 kilometers) below our feet. It’s not easy digging that far down- 660 kilometers is such a long way down. The deepest human borehole to be dug was just 12 km and they had to stop halfway through because the drill bit was being melted by geothermal energy. 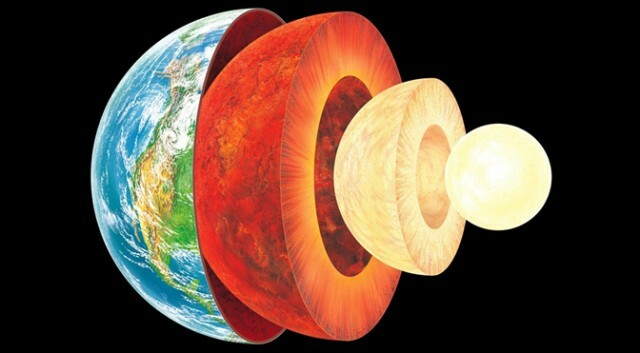 The new theory basically shows the Earth’s mantle as having a mineral called ringwoodite in plenty, and when ringwoodite is put under extreme pressure, it can trap water. USArray measurements done indicate that, as ringwoodite is pushed deeper into the mantle by convection, increased pressure forces water that is trapped out. This process is known as dehydration melting. The study now needs to provide the link between deep-earth geology and whatever happens on the surface. However, due to the complexity of earth and that it moves at a very slow pace, getting useful data takes years of measurements. There would be massive repercussions if the findings of this study are accurate. Even though the ringwoodite contains only 2.6% water, the transition zone volume means that this underground reservoir may contain enough water to refill our oceans three times over! We should not however continue to abuse our fresh water reserves due to this. This also discounts the theory that water on the surface of the earth arrived via icy comets. Next article Russian Physicists To Power The World Wirelessly By Rebuilding The Tesla’s Wardenclyffe Tower.